I'm so happy it helped! I cannot find the alternative to corn syrup. Could you point it out or post here to tell me? Thanks! In the UK we use Liquid Glucose, if that helps. Thanks for the information, Chantelle. You can get Karo corn syrup in the UK from Waitrose and Ocado. Thank you very much for all this information, pictures and helpful tips. Love this!! I've made tens of thousands of painted chocolate pieces in my lifetime and have been using the skillet the whole time. I can't imagine making them without it. It's worth the $20 investment. Hi Stefanie, as long as you fill the crock pot with water then set jars or bowls of candy coating in the water, it should work. Crock pots are usually quite a bit taller than a skillet, so it will be more challenging to work with, but I do think it will work. Let me know how it turns out. God luck with your cake pops. Thank you! I hope it all works out for you and that you have fun with your project. Hi.. i made some chocolate lollipops… It is good. my problem is when i am trying to pack them and put some ribbon… it became greasy.. So what i do… I will put them back on the fridge… so it will set again… What should i do? I need your help… Thank you. Hi, the problem you are having is that condensation has built up on your lollipops. They were in the freezer for too long, and they get sticky or wet when that happens. There is nothing you can do about this, other than let them sit at room temperature until they completely dry. They will have a bit of a texture once dry, because the beads of condensation will dry but wont really go away. You should only leave your lollipops in the freezer for about 5-10 minutes, until set. Yes, if you buy boxes of chocolate and store them in the refrigerator, it's best to leave them in the box until the chocolates come to room temperature, but if you are making lollipops and they have sweat on them before you package them, this process isn't going to help. I never recommend storing chocolates in the refrigerator or freezer, but do know that people often do. I don't ever refrigerate my modeling chocolate. I just wrap in in plastic wrap or a zip top bag and store it in a Rubbermaid or Tupperware container. Modeling chocolate by nature will harden as it sits and will definitely harden if it's cold. You can certainly use it to practice with, you'll just need to get it to soften up. You can microwave it on DEFROST for a few seconds, then try to knead it. Then into the microwave again for a few seconds on Defrost then try to knead it. You do not want to get it so hot that it really begins to melt, or you'll end up with a greasy mess. You can also put it in a zip top bag and set it in a bowl of room temperature water, not hot or warm water. Try to knead it after a while. You should be able to salvage it, at least to practice with. Taste it, and if it tastes good, and you get get it softened and workable, then by all means use it for a project. Good luck. This is an excellent article on molding chocolate!!! I love it, thank you! I made rum balls but the chocolate coating kinda melts (sticky) the moment i took them out from fridge. What shall i do? The reason your chocolate is sticky, is that it probably wasn't tempered correctly. When working with chocolate that has cocoa butter in it, you must work using exact temperatures. You need to melt it and heat it to 100-115 degrees fahrenheit then it needs to be cooled down to 88-91 degrees, depending on the type of chocolate (dark is usually 90-91 and milk and white are 88-90.) 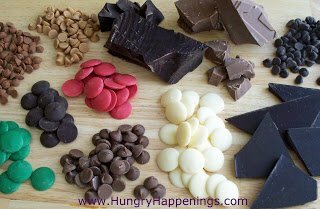 There are several different tempering methods and you can do an on-line search to find all sorts of resources regarding tempering chocolate. There are lots of videos too. I have two machines that temper my chocolate for me, that is why I didn't add tempering directions here on this page. I don't feel I'm an expert at it, being my machines do all the work for me. Good luck. hi beth! great article! very helpful!! thanks…. what can i do abt that? i want to wrap them in colored foils and make a bouquet so i cannot refridgerate them, becuse i need to gift them out. pls help…it would be greatly appreciated. it is happening becus i live in a warm place like panama? if so what can i do? and how to store them till i gift them out? Did you use merkens pure chocolate with cocoa butter in the ingredients or their confectionery coating with hydrogenated oil in the ingredients? If you used the first, it needs to be tempered in order to set up properly. If it isn't tempered then it will always be soft, it will never harden properly. If you used the confectionery coating and it pops out of the mold but later feels soft, it has gotten too warm. The only thing you can do is to cool your room where you are working. It's best if your room is between 65-70 degrees Fahrenheit, but that is a bit chilly for most, so 70-74 degrees would be alright. Anything above that, and you will have trouble with your candied melting. I never suggest refrigerating candies, as they will develop condensation, but if you just can't get your room cool enough, you may need to store them in a refrigerator, just be aware that they will become a bit wet upon removal. Hello 🙂 I was wondering if I could decorate sugar cookies using melted chocolate instead of icing? I love you tutorials and use them often. Yes, you can decorate with melted chocolate. You can pipe on designs, just be aware that it is a bit more challenging to pipe than icing as it will run a bit more. One suggestion would be to pipe your design onto a piece of parchment paper then add the design to your cookies once it has set. I might just do a tutorial on that technique! Thanks so much for your help Beth! How do you attach the design to the cookie after it dries on the paper? Thanks again! Just pipe a bit of melted chocolate onto the cookie and press the design down onto the cookie. I was looking at the pictures of your favorite creations. I love your packaging! Is the egg also chocolate? If so how did you get the two hollow halves to fit so perfectly? Hi, Yes the egg is chocolate decorated with luster dust. I use plastic molds that were made to create sugar eggs and the two halves line up perfectly. I bought the plastic eggs years ago. I am playing with candy melts and chocolate chips. I really want to infuse coffee into my chocolate. I don't want to use coffee grounds or add a ganache to the center. I was thinking of adding instant coffee grounds to melted shortening, then adding the shortening to the melted chocolate. Is this a feasible idea or would this leave the chocolate to soft to harden properly? You wont be able to add shortening to the chocolate, but you can just stir in the coffee grounds. Make sure you use really good quality coffee. I have done that before with a lot of success. Thank you for your timely responses! I find that to be as impressive as your fantastic chocolate creations. I plan on trying it tomorrow. If all goes well I will send them in a care package to our church's college kids. I was thinking back to a bark I used to make – I spread dark chocolate in a thin layer, sprinkled on some coffee, then drizzled on some milk chocolate. It looked pretty and the coffee lovers really enjoyed it. Just be sure to package it separately as it will be very aromatic.